WIN #36: A family pass plus extras to The Lost City Adventure Golf! Win a Family Pass, plus two beers and two slushies to The Lost City Adventure Golf in Nottingham! 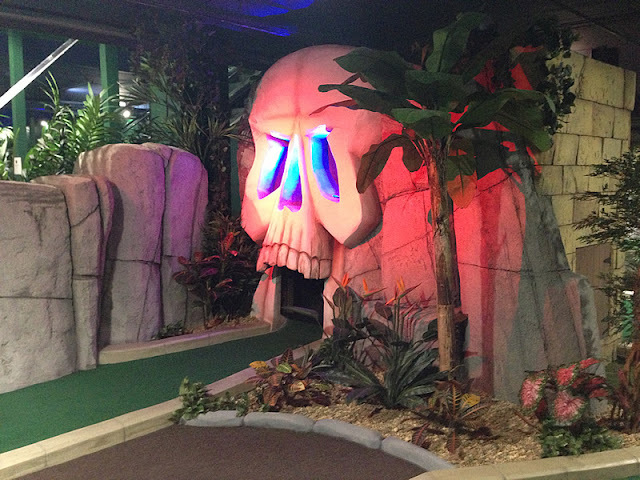 Two separate 18 hole indoor adventure golf courses - Sacred Skull Pass and Temple Trail wait for you to come and test your skills! Why not play Sacred Skull Pass and then relax on the mezzanine floor overlooking The Lost City enjoying a soft drink, or a beer or even a glass of wine, before challenging your friends on the Temple Trial? Expierence the challenge of playing amid a thunder and lighting storm on the carpeted greens, risking their venomous talking snake, talking idols and crumbling walls. Both courses have been designed to be wheelchair user friendly, so all adventures can play! If you can keep a steady nerve to the end and satisfy their Sacred Skull or Temple God, much gold will come your way! I have the following up for grabs from The Lost City! x1 Family Pass: Valid for up to 4 explorers (one must be 12 or under). x2 Ice Cold Slushies vouchers. x2 Beer vouchers (over 18s only). Please note: You must follow or like Unique Young Mum and The Lost City on at least one social media platform! To find out more about Lost City, check out the official website here.